The Guinness Book of World Records has it wrong. The most frequently stolen painting in the world is not Rembrandt's Portrait of Jacob de Gheyn III, stolen a measly four times from the Dulwich Picture Gallery in London. 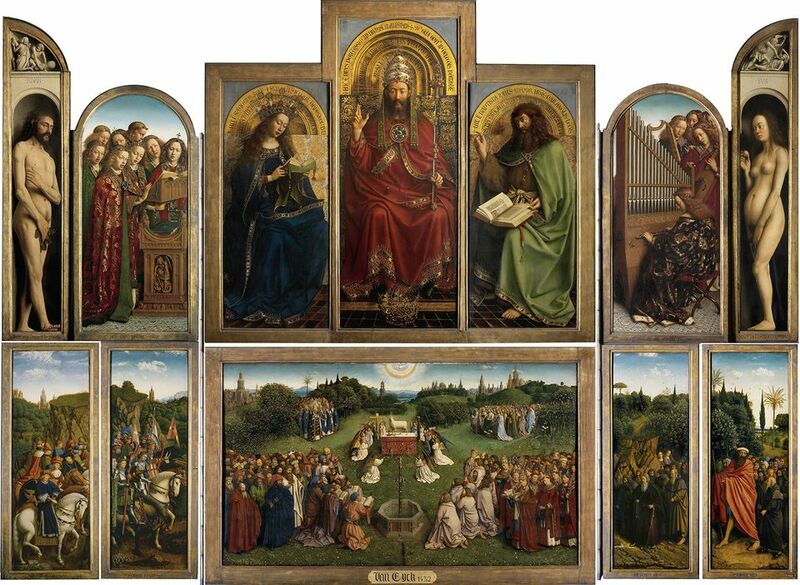 It is in fact the Ghent Altarpiece, also called Adoration of the Mystic Lamb, by Jan van Eyck. Completed in 1432, but begun by Jan van Eyck's older brother, this masterpiece of 15th-century Flemish painting was the most famous artwork in Europe upon its completion, and an object of pilgrimage for artists and thinkers. It was the target of some 13 different crimes, including having been stolen, all or in part, six times. Its story is more bizarre than fiction could possibly invent—and new twists in the tale continue to come out today. One of those six thefts is partly unsolved and remains a thorn in the side of the people of Ghent, and their police department, to this day. 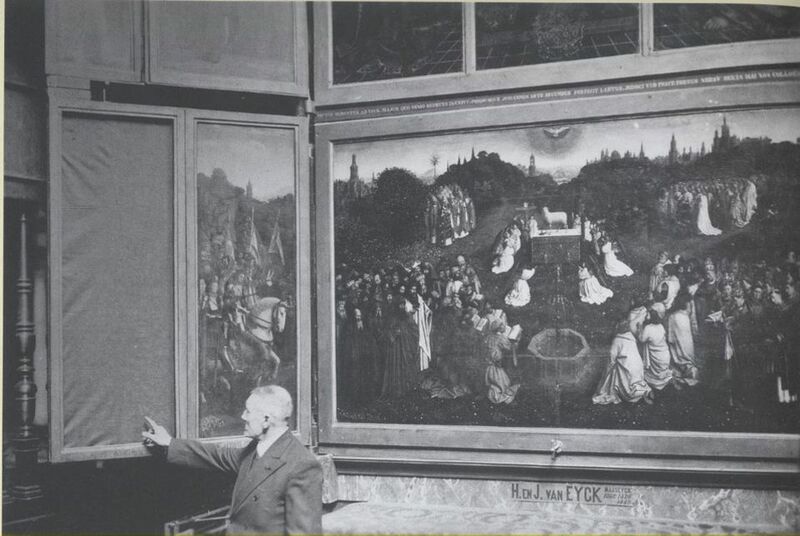 In 1934, one of the 12 panels that comprise the altarpiece was stolen from the Cathedral of Saint Bavo in Ghent during the night of 10 April. The panel had been sliced vertically in half; the back side, containing a grisaille painting of Saint John the Baptist, was left in the checked-luggage department of the Ghent train station as a show of good faith on the part of the thief, who sought to extract a ransom of one million Belgian francs (about £22,300) from the bishopric in exchange for the return of the other side of the panel, which depicted the so-called Righteous Judges. This side of the panel showed a group of men on horseback, including a portrait of the patron of the work, Duke Philip the Good of Burgundy, and of Jan van Eyck himself. It is part of an elaborate iconography that makes Adoration of the Mystic Lamb an encyclopaedia of Catholic mysticism, from the Annunciation to the sacrifice of a lamb, bleeding into a chalice, representative of Christ's conception and then his self-sacrifice. The triptych is arguably the single most influential painting ever made. But while eleven-twelfths of it is intact, miraculously after so many centuries of adventures, one-half of one key panel remains missing. If you visit Ghent to view the altarpiece, which was recently painstakingly restored, you may think that you are seeing the Righteous Judges panel there. But in fact, this panel is a copy made during the Second World War by an enigmatic and brilliant restorer, Jef van der Veken, who moonlighted as an art forger. Still, a few intriguing conspiracy theories suggest that it might have been the original, painted over and surreptitiously returned after ransom negotiations failed. A series of 12 letters were sent to the bishopric in an effort to negotiate the ransom of the Righteous Judges panel. The demands were curious and quirky. The man who sent the letters and engineered the theft of the panel from the cathedral was almost certainly Arsène Goedertier, a stockbroker who was heavily involved socially in the life of the cathedral. It has never been clear what his motivation was. Some thought that he had lost money, but one of his bank accounts was found to be nicely loaded with cash upon his death. Others think that he was part of an investment scheme with church funds that had failed spectacularly and that the theft was an odd attempt to recuperate the investment without exposing the guilt of the investors. Goedertier was short and stocky and had an eyesight problem, which meant that he would have been unable to steal the panel from the cathedral at night. A witness spotted two people leaving the cathedral that night with a panel-sized package wrapped in a black sheet tucked under an arm, although that witness may not be the most reliable—he was a thief himself, busy stealing cheese from a shop across the street at the time. Who the thieves were remains an open question, but Goedertier appears to have been the mastermind. He collapsed at a Catholic political rally several years after the theft. Afterward Goedertier summoned his lawyer, George de Vos, and spent 15 minutes alone with him in a room in his brother-in-law's house. When de Vos emerged, Goedertier was dead, but he had whispered a few dying words that sent the lawyer in the direction of a cupboard door in Goedertier’s writing desk. There he found carbon copies of all 12 ransom letters, plus a 13th letter that had never been sent. It indicated that the panel was hidden somewhere where no one, not even Goedertier, could access it without attracting public attention. This letter, and the fact that the panel has never been found, are endlessly intriguing and have inspired dozens of armchair detectives and treasure hunters. Some have made great progress, like Karel Mortier, a former Ghent police officer who has uncovered many clues that help fill in the story of the theft. The bishopric, to this day, receives numerous tips every year and follows up on some of them, passing others to the Ghent police department, which still maintains an officer in charge of this long-cold case. As I detail in my book, it appears certain that the initial theft involved hiding the panel somewhere on the premises of the cathedral. This was to facilitate its return: If a ransom were paid, the hiding place would simply have to be pointed out. But shortly after the theft, the panel was moved. It was moved again when Joseph Goebbels decided to send a Nazi art detective, Heinrich Kohn, to look for the stolen panel, as Goebbels planned to give it to Hitler as a birthday gift. But Kohn was unable to locate the panel, and it is thought to have been spirited out of the city. In 2012, I appeared in and helped to produce a BBC documentary, in which we went with the Ghent police to a church in the village of Wetteren, where Goedertier played the organ on Sundays. Behind the rood screen, we filmed an outline in the dust that was in the exact shape and dimensions of the stolen panel, which had almost certainly had hung there long enough for the dust to settle around it. So where is it? A new theory was proffered this spring. A pair of Belgian writers who recently published a young adult novel held a press conference at the Ghent City Hall in which they posited that the Righteous Judges panel is buried under Kalandeberg Square, a shopping area in central Ghent. This sounded like a publicity stunt, given their decision to reveal the location as a plot component in their novel. But the prosecutor's office of the city of Ghent indicated that there was merit to the suggestion. It pleaded with locals not to start digging up paving stones in the square but to let the police do so in an organised fashion. Will this reveal the location of the missing panel? I don't doubt that it will be found at some point. It may be just a matter of waiting for the right clue to come along. Whenever it is found, I’ll be eagerly sipping some Ghent beer, and eating Ghent waffles, in celebration.